I may have found the perfect earrings. Not in a shop of course, you can only get cheap plastic or vastly overpriced earrings in shops. I started out beading by making my own earrings, it’s very very very easy. These ones aren’t very easy, but I have been beading for some years now. I must pay more attention to my backgrounds when I take a photo. These are dangly, very neat looking and light. 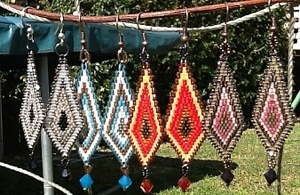 You can go nuts with the colours, because there are six in each dangle. I’ve been averaging a pair a day, and still want to make some in pink, in purple, in green, maybe a gold and cream. What I should actually be doing is some pendants I’ve been asked to make by a choir member and teacher’s end of year gifts, procrastination is my favourite way of doing things. If you want to make them yourself, have a look in the August/September edition of Beadwork magazine and look for the necklace that looks like a harlequin’s ruff. Why they did that to these terrific components, I don’t understand, they’re much better upside down as earrings. My daughter tells me that she needs a pair of these for her teacher’s birthday. I don’t remember birthday present for teachers being part of the school arrangements, and besides, the ones she’s chosen (the red and orange ones) go perfectly with a crazy top my sister made me buy from French Connection. With a roll of the eyes and a yoink, they’re gone. Of course I can always make another pair. I’ll start on the pendants tomorrow. don’t you LOVE BEADING 🙂 these are pretty! Yes, I love everything about beading. Buying the beads, sorting them, looking for new ideas, putting stuff together, chatting to other beaders. We beaders must stick together! Lynne, just name your colours.